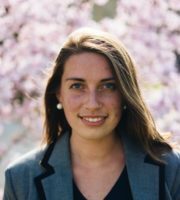 Several chapters of College Republicans around the country will host events to educate students about the Second Amendment and gun safety, efforts that come on the heels of the youth-led March for Our Lives gun-control movement. Take the College Republicans of the University of Nevada Las Vegas, which this month will host a gun safety event with the NRA U and will give away a year-long membership to the NRA, citing “all the recent events around the country regarding gun control” on its Facebook event page. 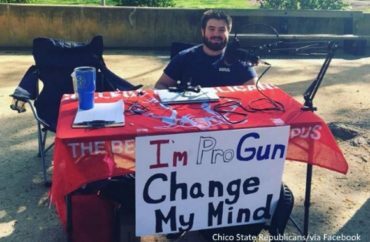 Over at Chico State, a member of its College Republicans earlier this week invited students to dialogue about the controversy at an “I’m pro-gun, change my mind” debate table. Later this month at Marquette University, its College Republicans chapter will also host an NRA U event, expected to address the myths of gun control, the history of the Second Amendment and the use of guns for self-defense, according to its Facebook event page. Meanwhile, some College Republicans have denounced the March for our Lives, such as the Stanford College Republicans. College Republicans at UC Riverside also released a statement March 25 responding to March for Our Lives. It called out those organizing the march and those participating for hypocrisy. “The irony of students marching for people’s rights to be taken away led by politicians and celebrities that utilize armed guards for protection is not lost on us,” the statement said. “We protect our politicians, money, courthouses, government buildings, celebrities, protesters, and our families with guns; we protect students with a sign,” Alan Nguyen, president of UC Riverside College Republicans, told The College Fix. Nguyen said his chapter will host weekly firearms safety courses and an open forum on the Second Amendment in the next couple weeks. Additionally, every month they promote “Women on Target,” a local event hosted by the NRA Member’s Council of California. “With these events, we want to show our community what the realities of being a legal gun owner are,” Nguyen said. He explained that the group seeks to debunk the myths and lies spread by the mainstream media and gun control organizations through education. “We will break down popular gun control arguments and address any and all concerns there are about proper firearms safety and handling, current firearms law as it pertains to law-abiding gun owners, and the cold hard facts when it comes to firearms violence in this country,” he said. Other College Republicans chapters, like the one at the University of North Carolina Chapel Hill, had planned gun safety events long before March for Our Lives. Will Rierson, chairman emeritus of the UNC chapter, explained that his group had been talking with an organization, Armed and Safe, months before the March for our Lives, so the timing of their upcoming event is coincidental, although relevant. He said he hopes that through the Armed and Safe event students and other community members will be more educated about firearms and their use in public. “Learning about firearms can help people better understand gun laws and rights, as well as the proper way to react in emergency situations,” he said.